Author(s): Yeek-Chia Ho, Kuan-Yeow Show. Environment, Hohai University, Nanjing, China and Zhejiang Juneng Co. Ltd., Tongxiang, 314500, China. The worldwide demand for energy is ever escalating commensurate with increasing populations and development. While fossil fuels as the current major energy resource are shrinking drastically, combustion of fossil fuel releases greenhouse gases, which are the main culprit for global warming and climate changes. Development of renewable energy appears to be a prominent solution to address these energy and environmental issues. Pyrolysis process converting biomass into energy offers a promising alternative for renewable energy supply. 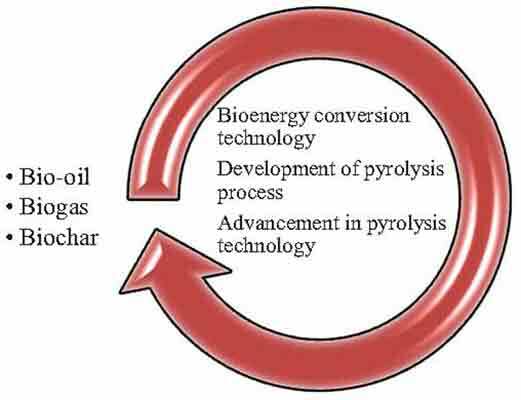 This paper reviews recent and state-of-art development of biomass pyrolysis research in producing biochar, bio-oil and biogas. Factors affecting pyrolysis processes and intrinsic properties of the pyrolysis products produced from different operating conditions are discussed. Advancement in pyrolysis technology as well as the challenges and prospects of pyrolysis for energy production are also outlined. Keywords: Biochar, biogas, biomass, bio-oil, co-pyrolysis, pyrolysis, renewable energy. Affiliation:Environment, Hohai University, Nanjing, China and Zhejiang Juneng Co. Ltd., Tongxiang, 314500, China. Keywords:Biochar, biogas, biomass, bio-oil, co-pyrolysis, pyrolysis, renewable energy. Abstract:The worldwide demand for energy is ever escalating commensurate with increasing populations and development. While fossil fuels as the current major energy resource are shrinking drastically, combustion of fossil fuel releases greenhouse gases, which are the main culprit for global warming and climate changes. Development of renewable energy appears to be a prominent solution to address these energy and environmental issues. Pyrolysis process converting biomass into energy offers a promising alternative for renewable energy supply. This paper reviews recent and state-of-art development of biomass pyrolysis research in producing biochar, bio-oil and biogas. Factors affecting pyrolysis processes and intrinsic properties of the pyrolysis products produced from different operating conditions are discussed. Advancement in pyrolysis technology as well as the challenges and prospects of pyrolysis for energy production are also outlined.